The United States Congress designated the Dolly Sods Wilderness (map) in 1975 and it now has a total of 17,776 acres. All of this wilderness is located in West Virginia and is managed by the Forest Service. In the mid-1800s, the Dalhe family used open grassy fields called "sods" for grazing sheep in this area, which now bears the name Dolly Sods Wilderness. The region, located high on the Allegheny Plateau, is known for its extensive rocky plains, upland bogs, and sweeping vistas. In the lower elevations, you'll find a forest of northern hardwoods and laurel thickets. Higher up, groves of wind-stunted red spruce stand near heath barrens where azaleas, mountain laurels, rhododendron, and blueberries grow. The bogs are unique depressions of sphagnum moss, cranberries, and the insect-eating sundew plant--an ecosystem you'd expect to see in northern Canada. Beaver ponds dot the Wilderness and the headwaters of Red Creek spill out of the area. Beginning in August of 1943, the military used the area for maneuvers and mountain training for World War II. Many of the artillery and mortar shells shot into the area for practice still exist. In 1997, a highly trained crew surveyed the trail locations and known campsites for shells. They found 15, some of which were still live. All were exploded on site. Many more may exist and they are dangerous. Since it is impossible to survey every acre of the wilderness, we ask that you stay on existing trails and use existing campsites. Dolly Sods Wilderness has nearly 50 miles of trails, many of which follow old railroad grades and logging roads. Streams can rise quickly during rain events. It's best to camp well away from streams and on the side of the stream you need to be on in the morning. This is easily the most popular Wilderness in West Virginia, and the amount of foot traffic proves it. Maximum group size is 10. 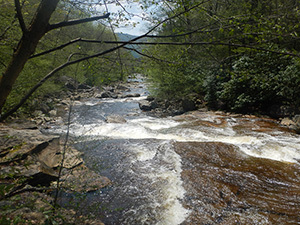 Planning to Visit the Dolly Sods Wilderness? How to follow the seven standard Leave No Trace principles differs in different parts of the country (desert vs. Rocky Mountains). Click on any of the principles listed below to learn more about how they apply in the Dolly Sods Wilderness.